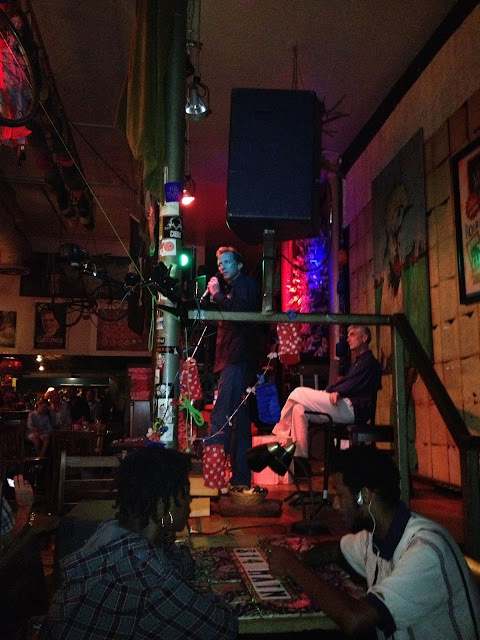 Two guys in a bar stood up on stage and took turns telling jokes. The jokes usually started, "Two guys walk into a bar..." they did this for 8 hours. Because it was art, it didn't have to be funny. And mostly it wasn't. The Art Guys are celebrating 30 years of collaboration with a new absurd performance each month. Many of these involve some feat of endurance--walking the length of Houston's longest street or shaking hands for eight hours straight. Or telling jokes for eight hours. The venue was Notsuoh. 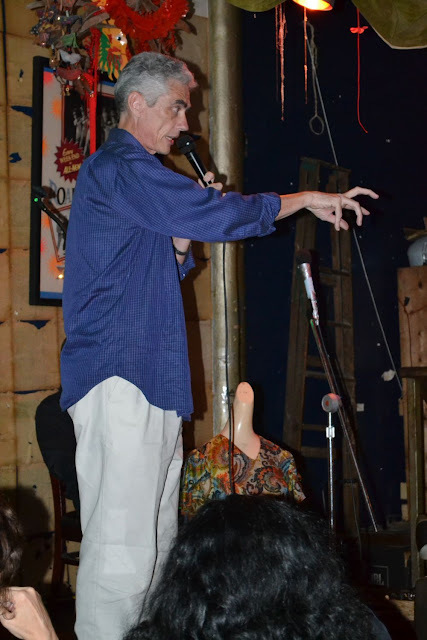 The format was a stage with two chairs, where Jack Massing would stand up, tell his "joke," then sit down. 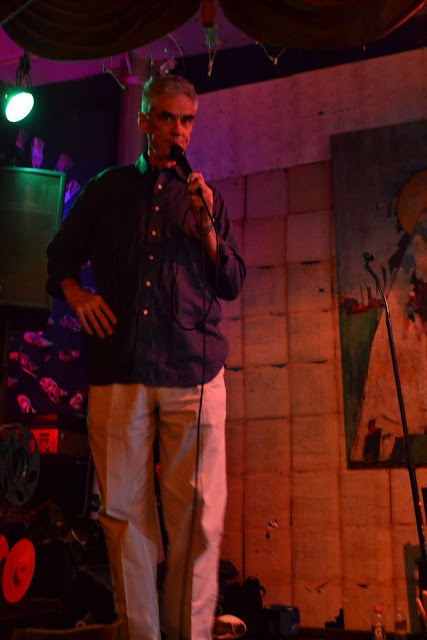 Then Michael Galbreth would stand up, tell his "joke," then sit down. Sometimes the jokes were long, sometimes very brief. But always two guys walked into a bar. For a while there felt like real tension. One would stand up and say something like "Two guys walk into a bar and one of them takes a shotgun and shoots the other one in the face." The the next would stand up and say something like "Two guys walk into a bar and one of them chops the other one's head off." This went on for quite a while. But most of the jokes were fairly benign. Galbreth was more a physical performer, wringing an incredible amount of emotion out of a lengthy dissection of the phrase "Two guys walk into a bar." Massing did a joke where he combined every element of every "_______ walks into a bar" joke he could think of. He did another where he muttered his joke inaudibly--but at great length. People wandered into Notsuoh, checked out the act, had a beer or two, left. The jokes never stopped. Me, I was there for about two hours. Then I had drunk just enough Lone Stars that I could still drive home, so I left. And when I was about to leave, Notsuoh owner Jim Pirtle came up to me and shook my hand. He was seriously upset. He had just learned that a local performance poet, Al-Gene Pennison III, also known as the Plastic Clown, had died late the previous night. He had been at Notsuoh, went to a friend's place, and then fell off a balcony. Pirtle was quite broken up about it. As for the Art Guys, well, the death of a Plastic Clown is a hard act to follow.